Highlights Magazine Lot of 10 magazines all from 2008 The magazines are in very good condition. There is no writing in the magazines. The pages are in good clean condition. They come from a smoke-free, pet-free home. I will be happy to answer any questions. HIGHLIGHTS MAGAZINE. ISSUE JUNE/JULY 1976. ANNIVERSARY ISSUE. "THE UNITED STATES IS 200 YEARS OLD". Highlights Magazine May 2019. Condition is Brand New. Delight the children in your life with this brand new Highlights magazine issue, May 2019. Features include "Carve Your Way", "Rainbow Lemonade", and Robots and Guacamole. 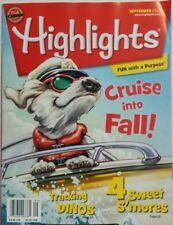 Highlights Magazine lot, great for home schooling, road tripping, offices, etc. 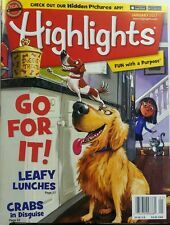 Lot of Highlights magazines for kids. A great lot of 11 Highlights Magazine Back issues. No duplicates. No markings on any issues. 2010 - 2013. A great lot of 10 never used Highlights Magazines. Dates ranging from 2012 - 2015. This is a great lot of 12 Highlights for Children. Dec of 2013 through Nov of 2014. No markings, like new condition. Lot Vintage Highlights Magazine Lot of 11 Highlights magazine in great shape. All are dated 1979 full year plus resource issue. No writing on any pages. These have been well preserved in the plastic Highlights storage container holder as pictured. 11 issues covering January they December plus resource issue. Highlights Magazine Lot of 10 magazines all from 2009 The magazines are in very good condition. There is no writing in the magazines. The pages are in good clean condition. They come from a smoke-free, pet-free home. I will be happy to answer any questions. A fun trip into children's lives in the early 70's can be found in these magazines. Happy to look deeper at specific issues, but a quick thumb through showed them pretty nice. HIGHLIGHTS THE MONTHLY BOOK FOR CHILDREN DEC. 1973. HIGHLIGHTS THE MONTHLY BOOK FOR CHILDREN-APRIL 1973. Highlights Magazine Lot of 10 magazines all from 2010 The magazines are in very good condition. There is no writing in the magazines. The pages are in good clean condition. They come from a smoke-free, pet-free home. I will be happy to answer any questions. May 2019 current issue of Highlights magazine. Several of my kiddos have subscriptions to this but share one copy so I had extra. Lot of 16 Highlights Magazine: 1988 - Children's Magazines Zoo Books MORE ! Lot of 16 Highlights / zoobooks and national geo kids magazines: from 1988 - 2017. T he middle row are the 1988 ones - all the magazines have no marks in them -Magazines are in g reat condition. December, 2018 (a bilingual issue - English and Spanish). March, 2018. July, 2018. In doing a quick scan through the pages, it appears that these have not been marked on (activities not done) - except I did find one activity done in both the July and December 2018 issues. LOT of 10 HIGHLIGHTS Children’s Magazines-Learning /2017 Free Shipping. Condition is Very Good. Shipped with USPS Media Mail. LOT OF 46 LIKE NEW HIGHLIGHTS CHILDREN'S MAGAZINES. 2006, 2007, 2008, 20-09, 2010. All from smoke-free and pet-free home. Fun With Phonics. Clean and good condition. Creative Thinking Activities. I will always work with you to correct any mistake on my part. This lot includes the following issues We are not experts in any field. We find interesting things in yard and estate sales, and pass them along to you. We do a little internet research and describe things as best we can, but you probably know more about the item than we do. These are used magazines with dates that include 2011-2018. We try to include only those books that are suitable to add to your collection. These are all used books and we only list books that are in good condition or better. HIGHLIGHTS MAGAZINE. ISSUE AUGUST/SEPTEMBER 1976. I will answer them to the best of my ability. Lot of 24 Highlights for Children Issues. June, July 1976 Highlights Magazine. Bicentennial, Anniversary Issue. Highlights- 3 issues. Children's Magazines. High Five- 6 issues. They are pre own and in Acceptable condition, pages show yellowing from age. I opened each one up to a random page to give you an idea of how they look inside, I did not find any writing inside. HIGHLIGHTS MAGAZINE. ISSUE JANUARY 1976. HIGHLIGHTS MAGAZINE. ISSUE MAY 1976. April 1964; December 15, 1974; February 1975; June/July 1976 (Anniversary Issue); October 1978; April 1979; May 1979; April 1980; January 1984. We have more. Due to the many variations in monitors and browsers, colors may slightly differ on different monitors. Date: March 2019. Cover: Party Monster. Magazine: Highlights Magazine. January, 2016. By Highlights. January, 2013. July, 2015. Highlights Magazines. Months: Jan, Feb, April, May, & June. ISSUE NOVEMBER 1976. HIGHLIGHTS MAGAZINE. I will answer them to the best of my ability. ISSUE FEBRUARY 1977. HIGHLIGHTS MAGAZINE. I will answer them to the best of my ability. October, 2015. September, 2015. November, 2015. August, 2015. July, 2015. They range in publication years from 1981-2015. ISSUE MARCH 1976. HIGHLIGHTS MAGAZINE. I will answer them to the best of my ability. ISSUE APRIL 1976. HIGHLIGHTS MAGAZINE. I will answer them to the best of my ability. 3 magazines have writing - Feb 2015 on the back cover, Sept 2014 on page 15, June 2014 on the back cover. I didn't notice any other markings. Lot of 7 Magazines from 2014 and 2015. 2015 - February, March. Firehouse Magazine - Jan 1985- very good used condition- even has the reply cards in place - 88 pages - - on the job London --Detroit Devils Night- hot shots - great magazine! 5 are the Highlights (1956-1965) and one is Child Life (1963). The cover is also torn off one of the Highlights as shown in photos. We will make every attempt possible to resolve the issue if we made a mistake. 1966 Highlights for Children Magazine: LOT OF 5 Jan-May EUC! HIGHLIGHTS FOR CHILDREN MONTHLY BOOK 5 ISSUES. YEAR OF 1966. ALL IN VERY NICE CONDITION! Binding on one of them has small tear (see pics). BIC Brite Liner Grip Highlighter, Chisel Tip, Yellow, 5-Count.